Enjoy a magical activity holiday, engage with creative learning and meet new people. Explore the highlands of Africa through a guided photography tour of Northern Ethiopia. Enjoy an exciting, stimulating and engrossing break, where you engage in learning through creative experiences. An ecotourism package of Northern Ethiopia with integrated daily photography sessions and workshops. Includes bed and breakfast accommodation in high quality guesthouses and eco-lodges which support the local economy. A 13 day ecotourism package of Northern Ethiopia with integrated daily photography workshops. Ethiopia’s diverse and dramatic landscapes are blessed with both breath-taking natural beauty and an array of unique historical treasures. This holiday includes bed and breakfast accommodation in high quality guesthouses and eco-lodges which support the local economy. All internal transport, airport transfers, National Park entrance and photography tutorials are included. The holiday workshop sessions are suitable for enthusiasts and beginners alike. The rate of learning is relaxed. During the course of the break you will explore essential photographic principles and techniques, but without excessive focus on technical aspects. Above all, you will enjoy an incredibly awe-inspiring activity holiday in a truly unique and breathtaking place. Ethiopia’s diverse and dramatic landscapes are blessed with both breath-taking natural beauty and an array of unique historical treasures. From the ancient tombs and obelisks of Axum, to 17th century castles and burnt-out Russian tanks, Ethiopia’s long and noble past is a story waiting to be told. Discover the towering crags and vast, fertile plains of the Ethiopian Highlands, home to dozens of animals and birds seen nowhere else on earth. Both the Simien Mountains National Park and the Bale Mountains National Park offer fantastic trekking opportunities and the chance to see the red-chested gelada baboon and the endangered Ethiopian wolf. To the Southwest lie the remote lowlands, a tropical landscape of rivers and plains home to some of Africa’s most fascinating tribes. Testing, awe-inspiring and breathtaking – a journey you’ll never forget. You don’t explore Ethiopia for a relaxing getaway, you venture here to be moved. And moved you shall be. You will be staying in quality guesthouses and eco-lodges along your way through northern Ethiopia. Eco-tourism is responsible travel to natural areas that conserves the environment and improves the well-being of local people. We work with local agents and local guides to organize your tour. We engage local guides where necessary to add to the experience and so they can share their expertise. Breakfasts are included throughout your stay. One traditional dinner in Kossoye Ecolodge is also included. All domestic flights, transfers/excursions are by minibus. Local boat across the Blue Nile, speedboat across Lake Tana. 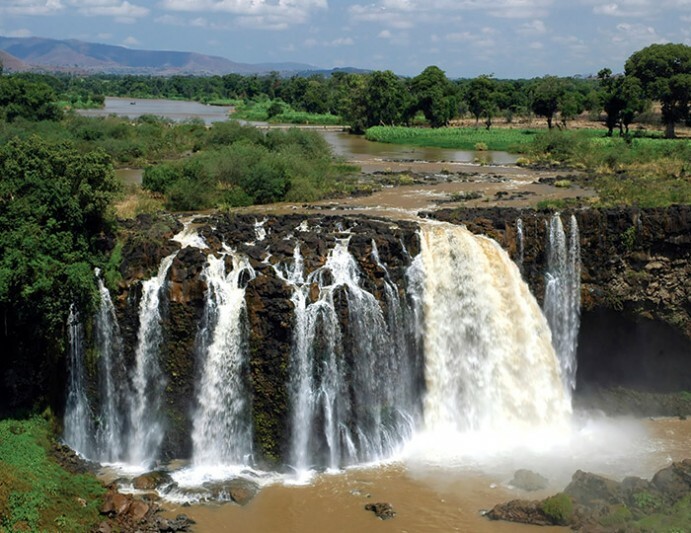 Along your way through Northern Ethiopia you will stay in high quality guesthouses and eco-lodges. In Addis Ababa you will stay at Arequ Guesthouse. All materials required to undertake the photography sessions and workshops are provided. When selecting a travel insurance policy you should make sure you are covered for medical expenses including emergency repatriation. We strongly recommend that the policy also covers personal liability, cancellation, curtailment and loss of luggage and personal effects. If you have credit card insurance we require proof of purchase of the trip (a receipt or statement) with a credit card in your name. In the afternoon a warm welcome awaits you from the Human Camera team. Your trainer will give a short introduction to the Photography Programme and an exploration with the camera. After your firrst internal flight you will meet your local guide who will accompany your tour of this relaxing city on the shores of the largest lake in Ethiopia. Visit the source of the Nile and stay in a charming eco-lodge in the middle of Lake Tana. Your stay in the ecolodge in Kossoye will take you further into the highlands of northern Ethiopia. A day trek offers plenty of opportunities for landscape photography and to spot the unique indigenous wildlife in Simien Mountains National Park. Explore the ancient imperial capital best known for it’s 17th Century castles and palaces. On route to Gondar visit the Ploughshare Women’s Association to purchase local crafts that support single mothers. Visit the isolated town set high in the mountains of Lasta. Famed for its immense rock-hewn churches, Lalibela is arguably the one place in Ethiopia that no tourist should miss. Former capital of the Axumite Empire from around the 10th Centry AD Axum is the most ancient capital of Ethiopia. Absorb as much as you can of the wealth of startling antiquities during your guided tour in the holiest city for the Ethiopian Orthodox Church. Before leaving this magical country, complete your photography training by creating a photo book of your journey from a selection for your snaps. NB: A professinal camera is not required for the Photography course. We can also provide point- and-shoot cameras if requested at no extra cost. The photography sessions and workshops will be run by Kallina Brailsford. Kallina - founder of HumanCamera - is an accomplished photographer with a MA Photography degree. She is an established artist and has exhibited her photographic work around Europe. of the interpretation of images. There will be plenty of time for one-to-one discussions with the photographer as well as photographic guidance during the tours. By the end of the holiday you will spend significant time developing you photographic story and putting together the selection of photographs that will form a photo book of your journey. Upcoming holidays/retreats are listed here. If you cannot see a workshop listed within the specified time period, try clicking the 'look for more' link. If no listings can be found it is because all currently planned events are fully booked. For further details click on an event in the schedule list. You can reserve your place on this holiday workshop via our online booking form. No payment is needed until we have confirmed your place.